Blue cheese wedged salad is lettuce (cut in a wedge) served with blue cheese dressing and sprinkled with bacon, tomatoes, onions and nuts. why is it that they still seem so “fancy” to me?! I LOVE them! 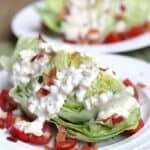 If a wedge salad is on the menu at a restaurant, I want it! They’re fun to eat, and paired with a delicious dressing, like this homemade Blue Cheese dressing, they’re hard to beat! This Blue Cheese Wedge Salad is inexpensive, easy to make, and it’s always a crowd pleaser! With Father’s Day coming up on Sunday I know this salad will be on my menu! Jeff loves it, and I love how easy it is to prepare! 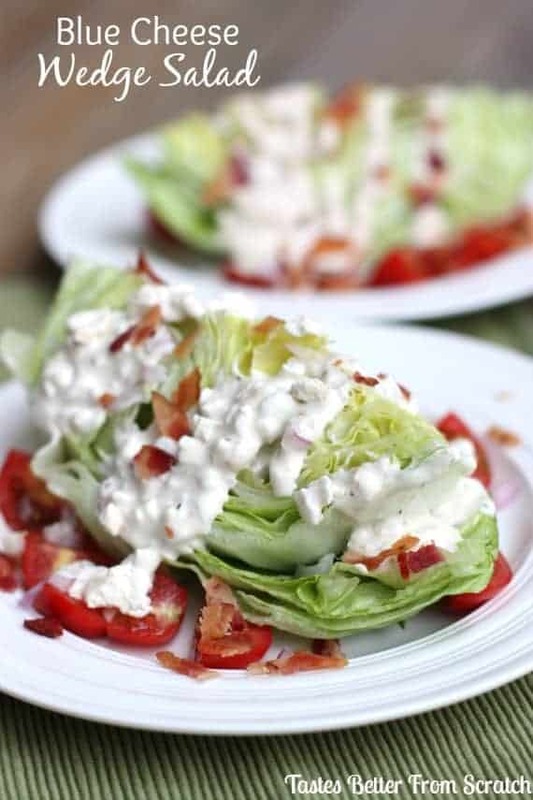 Wedged lettuce served with blue cheese dressing and sprinkled with bacon, tomatoes, onions and nuts. 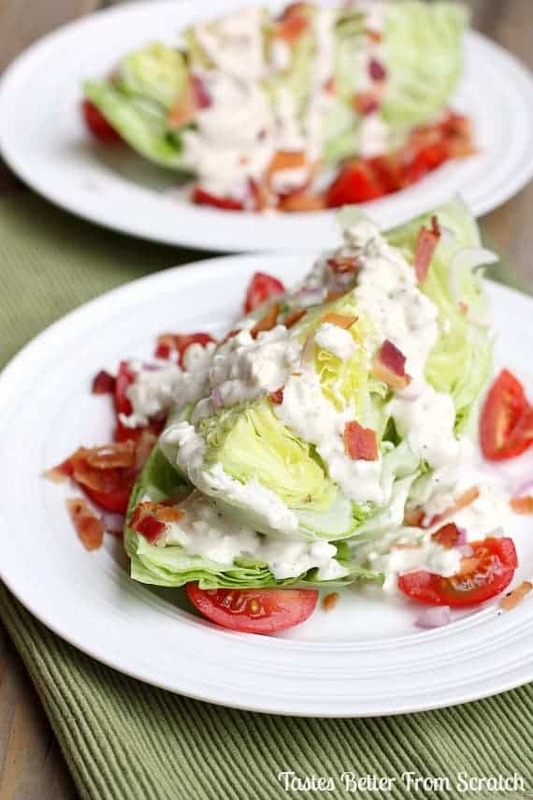 Place each lettuce wedge on a plate, drizzle with the blue cheese dressing and then sprinkle with crumbled bacon, tomatoes, onion, nuts (if desired) and any reserved blue cheese chunks. Garnish with fresh crushed black pepper, to taste. This Blue Cheese Dressing hits all the marks! Much better than the ones I’ve had in restaurants. I’ve been using this on wedge salads, mixed green salads and as a dip for fresh cut veggies. THIS WAS EXCELLENT: All I added was a little Balsamic Vinegar on top. As other viewers said “it is just like what you get in a restaurant-and that is so true. Thank you so much for the recipe.